Maybe it’s because I grew up Jewish, but I never understood the whole “post holiday blues” business. Until now. Last week, I shared ourfamily love affair with all things October, especially the grand finale of Halloween night. And now that it’s all but a memory, I can’t help but want to count down the days until we can start the festivities all over again. I sort of, kind of, maybe, ok definitely want to cry. But alas, as I tell C when he gets super sad when a favorite outing of his is about to end, you can’t cry because it’s over, you have to smile because it happened. I know it’s an old adage, I know I sound cliché. But ladies and gents, it is just so because it’s true. As I fight the urge to drown my sorrows and laments for the passing of the Pumpkin Latte in the new season of Gingerbread, I figured I’d pen one last post as a fond farewell. The Halloween celebration kicked off with a bang at C’s preschool event. Since I worked (relatively) hard on his costume and feared its ruin if he wore it to school, I convinced him it would be best if he went to the school party as a rock star. 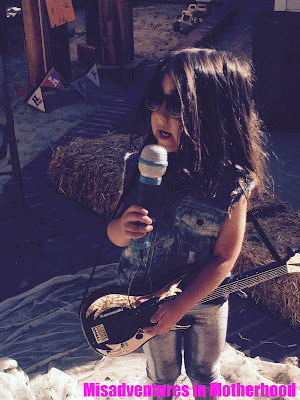 So I dressed him up in (last year’s costume) of metallic leggings, a black tank top, a ripped denim vest, high tops and of course, a microphone and an electric guitar. Lord help me. I fear my child might be headed for a career in the dramatic arts as he totally and completely transformed into the role. He went up to his friends at school and sang them songs, when the music teacher came out he got up on “stage” with him and jammed along. And he told everyone he saw that day that he was a rock star. It was adorable. Even more adorable was the project we put together for the school – the Witch Wall. Earlier in the week I went in to school, suspended a witch hat from the rafters, put a chair underneath it and asked all the kids to make witch faces. They played along, got into the spirit, and during the party, the pictures served as a great focal point of decoration. Afterwards, the parents got to take home the pictures of their kid. And who doesn’t love a party that has you bobbing for apples, decorating wreaths, making play dough, painting pumpkins and enjoying tasty nibbles from the Fatburger Truck and Hannah’s Bananas? A good time was had by all. By the time Saturday rolled around, C was raring to go and ready to be a robot. Thankfully, I remembered before we left for the trick-or-treat party we were attending, that the folks we roll with usually do family style costumes. A lastminute trip to Michael’s and 15 minutes later, the Motherboard and Dadbot costumes were complete. I'm proud to say that our family costumes were a hit at the party and whilst trick-or-treating, since I figured out how to get them to light up. I’ll admit I was pretty stoked every time we got a compliment about how creative the costumes were until BAM! We bumped into another homemade robot costume. It was so much more professional looking than my piece of tinfoil wrapped box that it completely and utterly took the wind out of my sails. I desperately try not to be competitive with anyone but myself, but for those of you who know me, you know I’m my own worst critic. Needless to say, this other professional looking costume that was sewn together only lit a fire under my arse for next year. Do you think it's too early to start planning? If you're still flying high on all the leftover Halloween sweets, I've got a Mommy pro-tip for you that's going to change your life. I successfully found a way to get C to part with his ridiculous haul of Kit Kats, Snickers and Tootsie Pops (minus a secret stash for Mommy, natch). 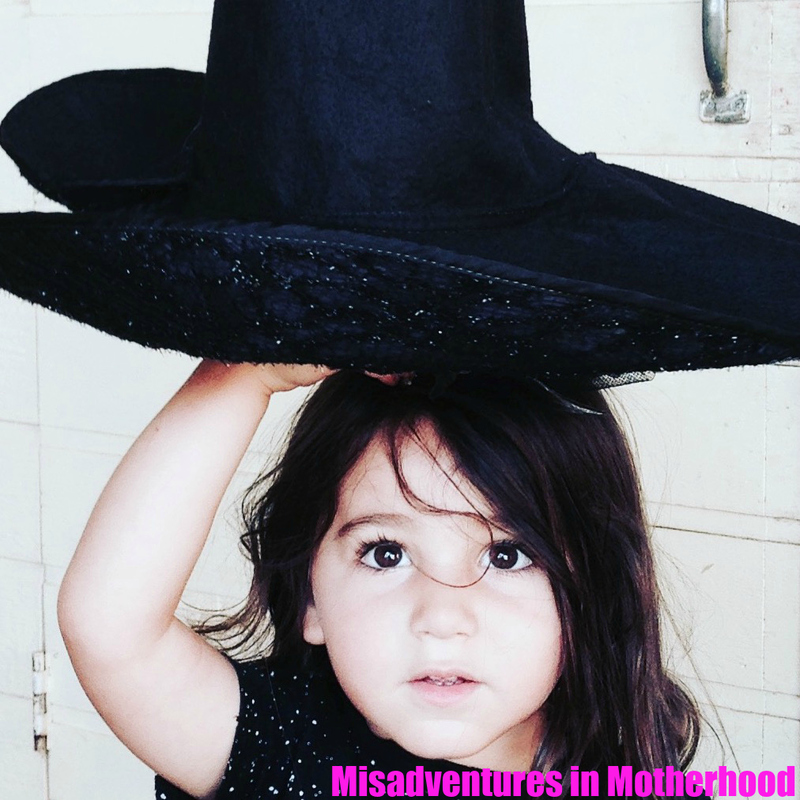 You might be familiar with the famed Switch Witch concept, wherein your little one puts their Halloween candy out for the Switch Witch, in exchange for a present. I planned on doing this, until I discovered the Halloween Candy Buy Back program. Yes ladies and gentlemen, participating dentists are willing to give your child cold hard cash in exchange for the candy they collected. The sweeties are then shipped to troops stationed overseas, which makes me feel doubly good about participating. C happily parted with his treats and proudly displayed the money. I even gave him the choice that he could either spend it now and get something small, or save it, earn some more of it and get something bigger later. To my delight, he opted for the latter and said, “a SCOOTER”. And just like that, we're full steam ahead on the Holiday season. Thankfully, Hanukkah has eight nights, which means that I'm so sick of latkes, presents, and overall merriment that I don't have the energy for seasonal withdrawal.